Please email us any additional information you have about a photo you see posted here. When you do write us, please include the photo's file name or URL. It is easy for us to get confused as to what information belongs with which photo. You can display the photos file name by holding your mouse curser over the thumbnail of the photo. (Example of a file name: flggrp1a.jpg). The last section of the URL is the file name. In the example above: flggrp1a.jpg. But you can just send us the complete URL. Then we know we are looking at the same photo for sure. Please try to be very specific as to who is in the photo, such as: "In photo file: flggrp1a.jpg, I do not know who the first person on the left is. However, the second person from the left is John Doe. The Third person from the left is Bob Doe. 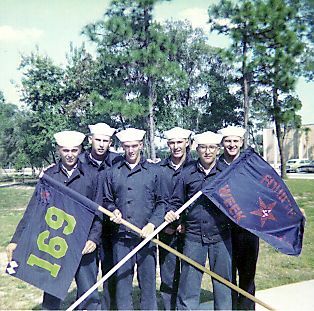 The photo is taken at the Company 169 picnic." The email address for sending additional info about photos is Company169@yahoo.com .